Mitzi Schwarz received her B.A. in Psychology from California State University, Northridge, and achieved Certification in Massage Therapy and Related Bodywork from the Institute of Psycho-Structural Balancing. Graduating with an MJS and a Certificate of Jewish Chaplaincy brings her closer to fulfilling her lifelong dream of understanding how to compassionately, competently and creatively serve people as they move through the seasons of their lives. She completed a two-year Clinical Pastoral Education internship at Cedars-Sinai Medical Center through the Academy for Jewish Religion California and since 2016 has been employed by Skirball Hospice as a Spiritual Care Counselor/Chaplain Intern. 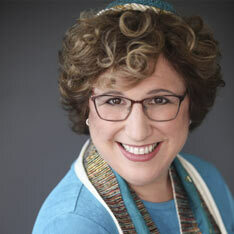 On the musical side of the spectrum, Mitzi served as the Cantorial Soloist for Congregation Makom Ohr Shalom in Encino for six years, during which time she worked alongside distinguished clergy which included Rabbi Zalman Schachter-Shalomi, z”). She has also worked at Temple Isaiah as a Cantorial Soloist/substitute, served as B’nai Mitzvah tutor and Junior Congregation Service Leader at Adat Ari El, and was the High Holy Days Cantorial Soloist at Congregation Beth Israel in Chico, CA. During the past two years she was a High Holy Days Cantorial Soloist/Shlichat Tziburah at Congregation Am Ha Yam in Ventura. In 2014, Mitzi released her first CD, entitled “Remember Who You Are: Songs of the Spirit”. Upon graduation, Mitzi Schwarz will continue to work for Skirball Hospice as a Chaplain/Spiritual Counselor.